Comparing bagels to bread provides the perfect example of two of the most important aspects of weight control -- portions and calories. When bagels and wheat bread are part of a balanced diet that stays within your calorie goals, both carbs can help you lose weight. But if you choose one medium-sized wheat bagel over two slices of whole-wheat bread, you'll consume more calories. When you're trying to lose weight, the bottom line is burning more calories than you consume by eating fewer calories and boosting your activity level. This means the first step is comparing calories in bagels versus wheat bread. Since a medium-sized wheat bagel has 245 calories and two slices of wheat bread only have 161 calories, it seems like the best choice is wheat bread. But you could go with half of a medium bagel, one slice of wheat bread or eat a small-sized wheat bagel, which only has 172 calories per serving. 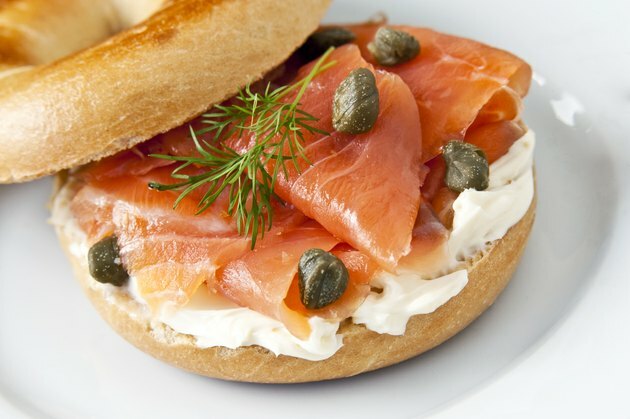 If you watch portions and calories, bagels and wheat bread can both be part of a weight-loss diet. Protein and fiber support weight loss because they make you feel full and sustain the feeling of satiety, which makes it easier to eat less food. Two slices of wheat bread have 1 more gram of protein and fiber than a small wheat bagel, so the bread has a slight weight-loss advantage. Whether you prefer a bagel or wheat bread, the most important thing is to choose whole-grain products because they retain all the natural fiber. A plain bagel made from processed flour is not a good choice for weight loss because it has half the fiber of a whole-grain one. When you cut down on calories, you're also at risk for losing nutrients. As a result, each calorie you consume should be nutrient-dense to be sure you get a sufficient amount of vitamins and minerals. Two slices of wheat bread provide significantly more calcium and vitamin E than a small wheat bagel; otherwise, the two have about the same nutrients. Both choices are almost equal when it comes to the carbs that will sustain your energy as you reduce calories. Two slices of wheat bread supply 27 grams of total carbs, while one small wheat bagel has 34 grams. With so many flavors of bagels and brands of bread to choose from, it's a good idea to compare products to be sure you choose those with the fewest calories and the most fiber and protein. Don't forget about toppings because some choices, such as high-calorie butter, may ruin your diet. Full-fat cream cheese has half the calories and fat of butter, and you'll further reduce calories by using low-fat cream cheese. Add more protein, fiber and nutrients -- and make a low-calorie meal out of your bagel or wheat bread -- by adding lean protein, such as egg whites or turkey topped with lettuce, tomatoes, onions, thinly sliced carrots or other vegetables.